The Book of the Dead provided instructions and rituals to help the many components of the ‘body of man’ to reach their destination in the afterlife and to ensure the continued existence and well-being of the ‘spiritual bodies’ in the afterlife. So begins Spell 1 of The Book of the Dead, here in this statement can be found clues to the theological thinking and purpose for which the Book of the Dead was written. By examining the religious background and theological philosophy of the ancient Egyptian, which led to the development of funerary texts, may the main elements and functions of the Book of the Dead and the hopes it offered to it owner become clear. When dealing with ancient religions and religious beliefs it is mindful to differentiate between modern interpretations and applications of religion and those same interpretations and applications in ancient cultures. One needs to try and remove the yoke of monotheistic thought that has dominated religious doctrine for the past 2000 years, to open up the mind to a way of thinking so alien to modern people. In ancient Egypt the gods are innumerable and were as real to the people of ancient Egypt as Jesus or Allah are today. As Frankfort points out “Religion as we Westerners know it derives its character and its unity from two circumstances: it centres on the revelation of a single god, and it contains a message which must be transmitted.” (Frankfort, 2000, p.3) But in ancient Egypt there was no one god or one version of the creation of the universe and mankind. They held that each was one possibility and explanation among many equally valid views. It with this in mind that we must avoid judging ancient Egyptian religious thoughts with our own 21st century perspectives on what constitutes a religion. “Ancient Egypt had no 'revealed text' in the sense of the major contemporary religions: a definitive, immutable text serving as the object of human exegesis.” (Meeks, 1997, p.5) The ancient Egyptians did not attempt to solve the problems confronting man using a single coherent theory. Instead, they allowed for multiple limited insights that are each considered valid in the proper context and approach. (Frankfort, 2000, p.4) Unlike our modern religions, ancient Egyptian religion was not based on a set of theological principles, nor did it really depend on the content of canonical writings. Rather, it evolved around how people interacted with their gods. · Ren – the true name. The same diversity of thought that occurs in Egyptian religion also occurs here in their concept of the ‘being of man’. It is for this reason that the deceased is at one and the same time in heaven (with the circumpolar stars), in the celestial barque of the Sun God Re, under the earth, tilling the Elysian Fields, and in his tomb enjoying his victuals. Just as there is a multiplicity of parts of the being of man, so there are many types of existence in the afterlife. Some represent philosophies of ancient times that instead of being forgotten are incorporated with current beliefs creating seemingly contradictory expectations of the afterlife. The funerary literature aimed to address all these different beliefs so that the deceased might survive and be resurrected in the afterlife. Here the deceased joins with the cosmic cycle of the sun, sailing in the solar barque of the Sun God and taking his place as a divine being. Spells 67, 100, 101, 102, 119, 131, 136b illustrate the concept of a solar afterlife in the barque of Re. In Spell 67 the deceased takes his place on the solar barque of the Sun God and the actions made to make his soul worthy of joining Re. The rubric of the spell describes how it should be performed. In the Middle Kingdom the sun god no longer rules supreme; Osiris becomes the king with whom the blessed dead hope to spend eternity. This new importance of Osiris in the afterlife can be see in his assumption of the role of judge of the dead. Spell 125 of the Book of the Dead deals entirely with the judgement of the dead, by which it was ascertained whether the deceased was worthy to enter the Kingdom of Osiris. Spell 110 deals with the description of the Field of Rushes or Reeds as a paradise for the blessed dead in the afterlife. Here the deceased receives offerings of bread and beer, oxen and all good things, clothing and daily incense. The deceased was expected to plough, reap, to eat and drink, maintenance of irrigation works, and all the things that were done in life for all eternity. Vignettes accompanying this spell show the deceased sailing in a boat laden with offerings, reaping wheat and driving oxen or ploughing the land. At this time the shabiti formulas appear, to relieve the dead from all the hard work in the afterlife by providing a magical substitute worker. The deceased’s Ka or double, which possessed the form and attributes of the deceased, dwelt with the body in the tomb though it could wander about at will. The deceased could partake in the offerings brought to the tomb by the ancestors or from the magically activated Tables of Offerings inscribed on the tomb walls and papyrus. These offerings provided sustenance not only to the Ka but also the Ba and Khaibit. Untold generations lived and died with the belief that those things required in life would also be needed in death. The tomb provided the house for the physical body, the Ka, the Ba and the Khaibit. It also provided a place to partake in food and drink from offerings placed in the tomb. The Book of the Dead offered spells and recitations to magically provide for the sustenance of the deceased’s spiritual bodies. The Book of the Dead is a group of funerary chapters, which began to appear in ancient Egypt around 1600 BC. In the Pyramid Texts from the 5th and 6th Dynasties, these Pyramid Texts were carved inside pyramid walls of the Old Kingdom in Egypt. Some of the oldest chapters of the Book of the Dead can be traced back to utterances from the Pyramid Texts; for example §257-68, Utterance 247, ‘The officiant addresses the king’ (Faulkner, 1998, p.59), its development can be traced in the Coffin Texts as Spell 349, ‘Not letting a man’s magic be taken from him in the realm of the dead’ (Faulkner, 1994 Vol I, p.282-3) and finally in the Book of the Dead in Spell 174, ‘Spell for letting a spirit go out from the great gate in the sky’ (Faulkner, 1985, p.173). In the Middle Kingdom more Spells were added and the texts were written in hieratic, not in hieroglyphics, within the wooden coffins and are known as Coffin Texts. The Book of the Dead derives in large part from the Middle Kingdom (about 2025-1700 BC) Coffin Texts. By the 26th Dynasty the sequence of chapters was standardised into a series of over 150 'chapters', most with their own vignette. Individual chapters occur on other funerary equipment, such as the shabti, headrest, amulets, heart scarab, and also on the coffins, sarcophagi and walls of burial chambers and offering chapels (Forman/Quirke 1996, p.183). The texts are divided into individual Spells or chapters, around two hundred in total, though no one papyrus contains them all. Specific chapters could be selected out of the total repertoire. If the prospective owner of a Book was wealthy and his death not untimely, he might commission a scribe to write the text for him, based upon his personal choice of Spells. Other less wealthy clients had to make do with a ready-made text template. The spells contained within the Book of the Dead can be divided into 5 main categories. They provide practical help and magical assistance in the provisioning and protection of the deceased in the afterlife. Magical Spells – those spells needed by the deceased for the activation of amulets and ushabti’s etc. Spells such as Spell 5, 6, 23, 24, 29A, 155, 156, 157, 158, 159, 160, 166, 169, 170 and 171, which cover activating ushabti’s to work in place of the deceased in the afterlife to the activation of various amulets such as Djed Pillar, the golden collar and the papyrus column. Transformational Spells – designed to be used by the deceased to able to transform into various objects, animals and gods in order to become identified with them. Spells such as Spell 76, 77, 78, 79, 80, 81a, 81b, 82, 83, 84, 85, 86, 87 and 88, where the deceased can be transformed into a falcon of gold, a phoenix, a heron or a swallow amongst others. Protection Spells – these spells are to be used by the deceased in preventing death and injury etc in the afterlife. Spells such as Spell 22, 25, 26, 27, 28, 29, 29a, 30a, 31, 32, 33, 34, 35, 38a, 38b, 43, 44, 45, 46, 53, 54, 55, 56, 57, 58, 59, 61, 62, 63a, 63b, 163, 164, 165, 175, 176, 177 and 189. Here the deceased is protected from snakes, crocodiles, being decapitated, not dying again, not eating faeces or drinking urine, breathing in the realm of the dead, stopping the corpse from putrefying and causing the soul to live in the realm of the dead. These spells are aimed at providing help in overcoming the possibility of dying a second time on the journey to the afterlife. Guides and Directions – these spells are to be used by the deceased to help navigate the underworld and overcome its many obstacles. Spells such as Spell 18, 98, 99, 100, 101, 102, 104, 110, 117, 118, 119, 124, 125, 126, 141, 142, 143, 144, 145, 147, 149, 150, 168, 175, 177, and 178. These spells allow the deceased to overcome and opponents in any divine tribunal, for fetching a ferryboat, making a soul worthy and permitting it to go aboard the Bark of Re, sitting among the Great Gods, passage through the Field of Offerings, taking the road to Rosetjau, knowing the Keepers of the Gates, entering the portals of the House of Osiris, and for knowing the Fourteen Mounds. It illustrates the many difficulties required to overcome before entering the afterlife and how the Book of the Dead could provide both magical and practical help. Prayers and Hymns – these spells are to be used by the deceased to give praise to the gods and spoken when entering the presence of various gods. Spells such as Spell 1, 15, 17, 59, 103, 127, 138, 141, 142, 143, 173, 175, 180, 183, 184, 185, and 186. These spells vindicate the worthiness of the deceased to be in the presence of the gods and to allow him to take his rightful place in the afterlife as a ‘vindicated soul’. In order for the deceased to dwell in paradise, they had to pass the judgement of a divine tribunal before becoming ‘justified’. However, to reach this tribunal the deceased had to make a journey, one that was fraught with pitfalls and dangers. The underworld of Osiris was not immediately or easily accessible and the Book of the Dead provides a written guide for the dead and a means of bringing them to their goal without mishap. Yet the dangers could not simply be avoided by knowing the maps and routes: some of the roads led to dead ends or to evil creatures lying in wait for the unfortunate dead. Spells, which could be learned by the dead, could help in completing a certain stage of the journey. The Book of the Dead provides Spells for overcoming obstacles such as crocodiles, snakes, beetles and other dangers so that the dead could continue to the realm of the blessed dead and not die in the afterlife. After negotiating these obstacles, the deceased had to pass through a number of gates or portals (the numbers vary from 3 to 7) to approach the gods. The deceased associates himself or impersonates various gods such as Re, Atum, Osiris, Thoth and Anubis in order to pass these portals and continue to the Great Hall of Osiris and the weighing of the heart. The heart, the seat of man, is weighed against the feather of Maat. 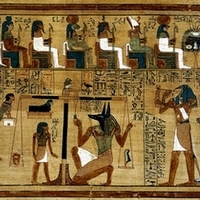 Here Anubis is in charge of the weighing whilst Thoth records the verdict. The dead has then to recite a declaration of innocence before the assembly of gods, headed by Osiris. The rubric accompanying this spell gives instructions for when the spell should be performed, what the deceased should wear and what offerings should be presented. In return the deceased will flourish and be given offerings from the altar of the Great God and shall be granted access to the gateway of the west to take his place in the suite of Osiris. In part, the work is an exposition of what a proper led life consists of; the text is unique in ancient literature in that it shows an elaborate and ritualistic judgement of the dead by the divinities. The primary ethical responsibility is to live one's life according to Ma’at, or truth. In this manner the Book of the Dead acts as ‘Wisdom Texts’ defining social and ethical values in life and their relation to the deceased as judgements of the soul in death. The Book of the Dead provided instructions and rituals to help the many components of the ‘body of man’ to reach their destination in the afterlife and to ensure the continued existence and well-being of the ‘spiritual bodies’ in the afterlife. It allowed the deceased to become at one with the Imperishable Stars, to join with Re in his solar barque, to be restored in the afterlife like Osiris, to take their place in the Field of Rushes and to be active in and around the tomb. These ancient texts were commissioned by the deceased before their death, and were the deceased's guide Book to a happy afterlife. The text was intended to be read by the deceased during their journey into the underworld. It enabled the Dead to overcome obstacles of the underworld and not lose their way. It did this by teaching passwords, giving clues, and revealing routes that would allow answering questions and navigating around hazards. The texts provided the correct responses to challenges that the deceased had to overcome before entering the afterlife. By knowing the correct responses the deceased hoped to continue his journey and reach the afterlife. The texts would grant the help and protection of the gods while proclaiming the deceased's identity with the gods to attain an afterlife of bliss in the Fields of Reeds. These ancient funerary texts represent complex and differing thought’s, on the age old question, of what happens to a person after death and how the ancient Egyptians provided solutions to this problem. In writing the Book of the Dead old thoughts and beliefs were not discarded whether this was done from actual belief in all of the various afterlives or a case of being noncommittal and including all variants is unknown. Yet it is to this end that spells of the Book of the Dead aim to fulfil, to offer guidance and assistance in reaching any of the various possibilities. What of the owner, what did the Book of the Dead hope to offer them? In part it provides comfort and reassurance that death is not the end and that the mummified remains are not the last episode of a living, breathing person. It provides answers to the question of what happens after death and what happens in the place where none have returned to tell. It gives hope to the deceased that he, like Osiris before him, will be resurrected and ‘born again’ in the afterlife and to continue that existence for eternity.